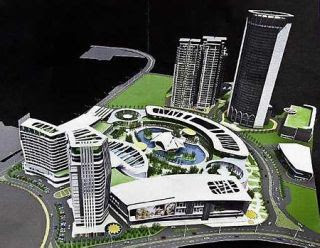 An artist's impression of the Batu Lintang project that will change the skyline of Kuching. KUCHING: Kuching skyline is set to change with the construction of a 36-storey office tower in the prime area of Batu Lintang. The proposed tower will beat the city's tallest building, the 22-storey Wisma Bapa Malaysia in Petra Jaya which now houses the Chief Minister's office, several ministries and the state secretariat. The tower is part of Sarawak's biggest mixed-development project jointly undertaken by Naim Holdings Bhd with Lembaga Amanah Kebajikan Masjid Negeri Sarawak (LAKMNS) and Tabung Baitulmal Sarawak (TBS), both state charitable trusts. Naim has a 70% stake in the joint venture while LAKMNS and TBS each holds a 15% equity interest. A memorandum of understanding (MoU) on the project was signed recently. Naim managing director Datuk Hasmi Hasnan said other components of the 13.6ha project were a 27-storey apartment, 18-storey condominium, a second office-tower block, hotel tower, a four-storey shopping mall, a 17,000-sq-ft showroom and multi-storey car parks. 'We will incorporate a water theme park, roof garden and plenty of green areas to make the development environment friendly and one that the local population can enjoy,'' he added. The project site was previously occupied by government quarters. The land has been cleared and earth-filling works was completed recently. Hasmi said the project would be carried out in phases over 20 years, with the apartments to be built first. The apartment block will have 115 units and the condominium 216 units. “For each phase, we will do in-depth study on market demand and supply to take cognition of any changes in the economic climate to ensure the project's success,'' he said. Hasmi said the development was expected to create 2,000 jobs and would provide business opportunities to retailers and wholesalers.